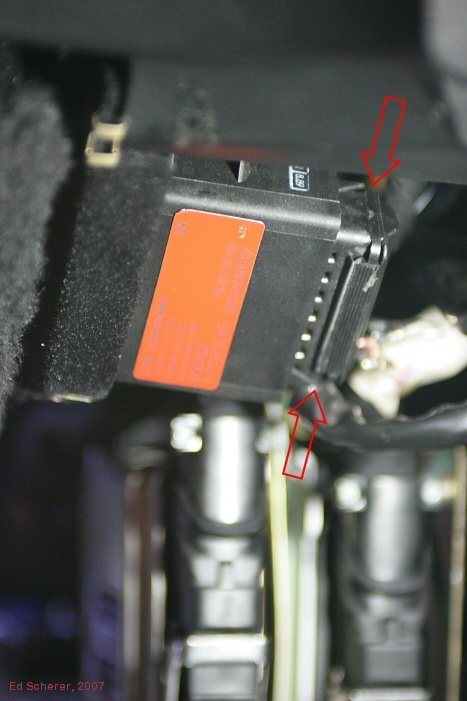 Since, in the process of helping somebody troubleshoot a problem today, I just got done tracing what goes on in the connector I showed back in post #32 and repeat here, I wanted to share the findings here in this thread for future reference. This is for a '90 928 S4; it seems likely that other S4/GT/GTS model years would be the same, but I didn't verify that. Last night, at long last, I finally finished up my LED mods. I'll probably do some kind of write-up pretty soon, to add to the already good write-ups that others (like borland) have done recently. Just one more data point to add to the experience knowledge base. I'll provide some explanation along with photos. First, here's the lamp control module, after the carpeted piece of trim held on by three Phillips screws has been removed (this is under the dash between the central electric panel and the right-side door, above the LH and EZK modules). You'll want to yank that connector off; it'll probably require a little effort, as it's on there pretty tightly. There are no interlocks; it's just tight. BTW, you don't need to remove the bulb control unit, you just need to unplug the cable. Once you have the cable unplugged, use some flat, wide-bladed tool like a putty knife or wood chisel (I used a 3/4-inch wide wood chisel) and pry open the connector along the long edge that isn't hinged; it'll open up, revealing the pins soldered to the wires as shown in the next photo. Be careful when you open this up, because some of the wires and pins might immediately pull out. Cover them with your thumb or something so they don't pop out! 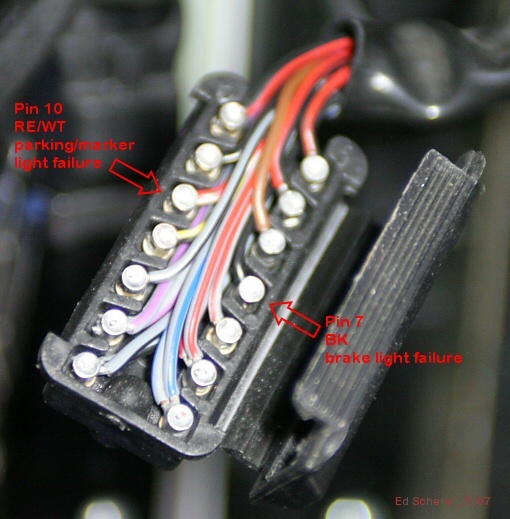 Use your needle-nose pliers to pull out pin 10 (RE/WT wire) to prevent the parking/marker light failure signal from reaching the pod and pull out pin 7 (BK wire) to prevent the brake light failure signal from reaching the pod. Pull them well back and snap the connector shut again, being careful that all the pins are pushed in again (visually confirm this by looking into the pin holes once the connector is closed again; I had two pins that didn't seat properly the first time I did this, and I had to open it up again and fix that). 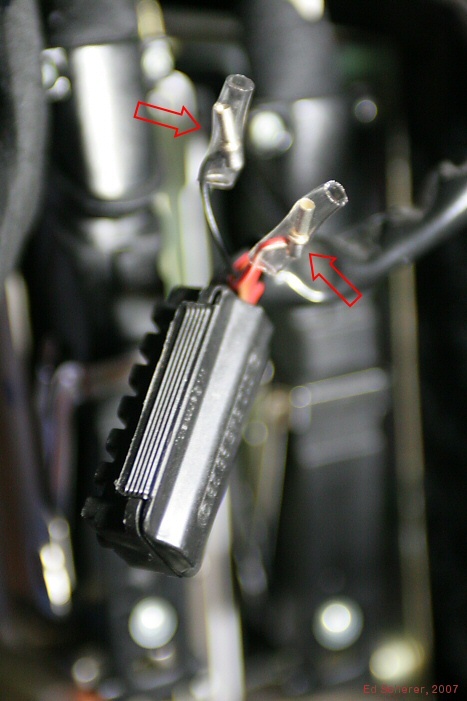 I then used some clear heat-shrinkable tubing to insulate the pins that I removed from the connector, as shown here. Reattach the connector to the bulb control module. Test that the bulb control module is working to your satisfaction. Then refasten the carpeted trim piece. You're done. Sleep easily, knowing that you can easily reverse this sometime in the future if you need to. Ed! This is perfect and far better than cutting the trace's on the board. Thanks for all your excellent contributions!